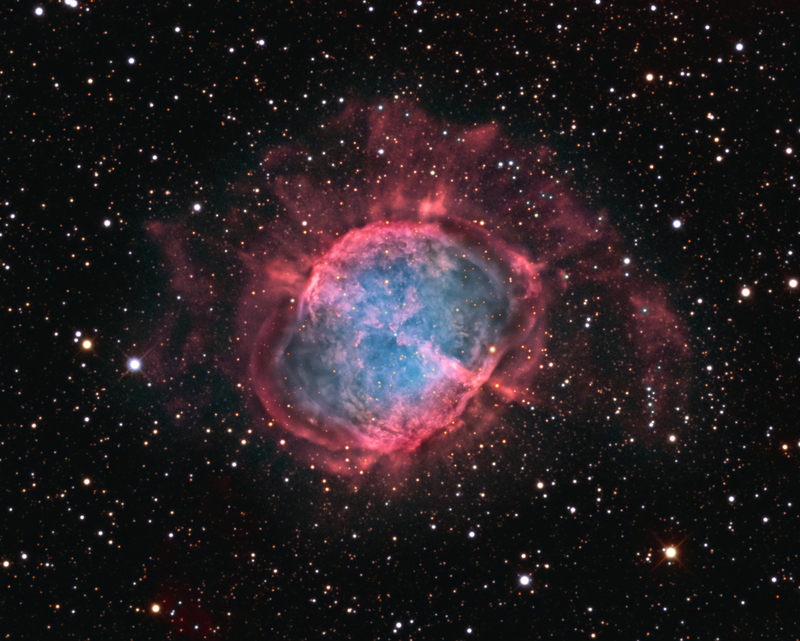 Here is a deep version of M27 with an emphasis on the Ha component. Ten hours of data were necessary to demonstrate the extended outer shell of hydrogen without objectionable noise, and the best 4 hours of data (average FWHM 1.6") were used for the central region of the nebula. The RGB exposures were of very modest duration (4.5 hours total) and there is no luminance (unfiltered) data. The result is a version of M27 that showcases an unusual amount of fine detail. Current theories suggest that most observable planetary nebula are formed in binary systems, since the companion star's interaction with the evolving planetary is necessary for it to be bright enough for detection.